Even though this was more of a documentary type film I still found it fascinating to watch. Typically I don't get into documentaries, I'm bored easily but this was so interesting. Growing up as a child I learned about Noah's Ark in Sunday school class (probably like most of you), well I've always wanted to see it and it's been a mystery that has kept my interest for years and years. 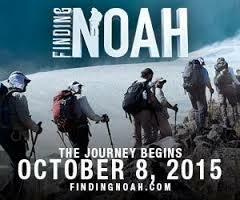 Anytime I hear news of Noah's Ark I always listen in of hopes that they found it. I know it's out there but just want to see it with my own eyes. I don't want to give anything away before you see the film but I think you'll find it fascinating because there were several harrowing moments that you won't want to miss. It's only showing for one night in about 640 theaters so save October 8th, 2015!